Seeing beyond the blind curves of bailouts and meltdowns takes the keen vision of a veteran market observer, Roger Wiegand, Editor of Trader Tracks. In this exclusive interview with The Energy Report, Roger gives us his latest thoughts on the bumpy road ahead and where he sees opportunities in the energy sector. The Energy Report: Roger, the last time we spoke, early in October 2008, you were predicting oil would reach a new high before the end of the year. Obviously that hasn't been the case. What's your take on what's happened since then? Roger Wiegand: What’s happened is that we thought oil would go to new highs, and it looked that way on the charts for the longer term technically. Other top technical advisors and institutions like Goldman Sachs had analysts’ prices that were pretty much in line with ours. 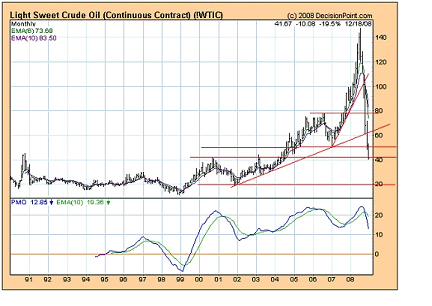 They were looking at $150, $147 crude oil prices just like we were, and expecting them to go even higher. Then, of course, the credit crisis smash arrived and markets came down. It was obvious at that point primary countries worldwide were headed into a deep recession, and there was a major and dramatic price reversal. Shortages for the longer term remain, but our crude oil price right now has come down a great deal simply because of recessionary factors. I would say that is the primary problem. TER: And by recession you mean the demand factor? RW: The demand factor, yes, even though gasoline prices in America have come down from $4 a gallon near the peak to around $1.46 or $1.50 at my local gas station, and gas prices continue to fall. The reason is people are simply driving less; there’s just less disposable income out there for leisure trips, vacations and those non-mandatory trips for work or shopping. Conservation and new savings ideas have taken a grip on energy. TER: If we’re going into worldwide recession, and many have claimed that we’re in deflation and will continue in deflation for at least another quarter, what does that mean for commodities? Many people are still saying that we’re going to be in a commodity bull for the next 10 years, and this is just a little downward blip. What are your thoughts on this? RW: The commodity bull has changed from the standpoint that as far as the commodities that we require in our everyday lives, those prices should remain firm and can rise with inflation. Among these would be food-related markets and gold and silver purchased and traded for security, safety and wealth protection. On the other hand, base metals for industry and those commodities used in discretionary purchases (autos, homes, appliances, furniture) sold down hard and can recover only very slowly or stay flat. The energy markets have gotten pushed down so far due to falling demand and prices dropping from drastically overbought positions. Oil prices came down from $147 to $40. This week of mid-December, crude oil was trading in the mid $30.’s. Oil is currently trading in a weekly range of $40 to $50. The last major price support on our weekly charts is $20. Some are saying that price is coming next. A few weeks ago we would have thought that is impossible. Now, we are not so sure. We expect prices to stabilize in 2009 and then trade higher but, very gradually. Fundamentals on shortages still do exist, but we have got to go through a prolonged recessionary period with lower prices, I believe, before we can return to the higher prices that we had before. There is plenty of crude oil temporarily housed on large ships parked with no destinations. TER: When you say higher prices than we had before, do you mean going back up above $100? RW: I think we could go far above that, but we’re talking three to five years or more, out from now. All of these prices, whether they be crude oil or natural gas as a package, have been pushed down in a deflationary environment because of recession. Some are saying you are already seeing depression price levels in certain markets within the context of our entire global system. Here in my state of Michigan, industry in past years was always operating near peak demand, especially for industrial electricity. Now we hear electric power demand in Michigan is down over 10%. For example, next spring, despite the fact that commodity prices came off highs in the grains, I think we’re going right back where we were before. There are still very high remaining costs of gasoline and diesel fuel embedded in products for farmers, especially in fertilizer, and cost of seed. In Argentina, for example, where they have done a lot of planting with soybeans, the government unexpectedly imposed higher new taxes to the tune of 40%. This was a radical increase and occurred while farmers hadn’t yet received all of their money out of the last year’s crop. This tax surprise caused immediate new crop under-planting. So, within the food area, we expect prices will continue to rise in the normal, inflationary cycles. Grains and gold remain our primary bull trades for 2009 with certain currencies. While some trades are expected to appear in energy markets, we think the bloom is off that rose for a long time. TER: So, looking at the commodity bull market, somewhere along the line, core commodities such as food will have to increase. RW: They will have to increase because there’s going to be shortages. We say grains prices will be going to be higher. We also think crude oil was so high and overbought that it can’t go back to previous highs for years simply because there is not that much pressure to buy it. Industrial and consumer credit is paralyzed. Nobody has any buying power and even the best companies lack longer-term staying power. Cash is king once again; just like the 1930s. In the U.S., a good percentage of farmers may not plant next spring, as they cannot get credit. The 200-day moving average is about $8.21. Normally for natural gas there is a rally in February through June for two reasons: February is the highest winter price month using natural gas for heating, and the following peak arrives in a July and August rally as natural gas is used in power plants to run commercial and residential air conditioners. A lot of people are not aware of that big spike, but if you look at natural gas this year we were about $8 and we went as high as nearly $14, and a lot of that growth came after May rising $10 to $14 during May to July. That price rise was mostly an air conditioning spike. TER: What’s the prognosis for coal? Coal is in abundant supply here in the U.S.
RW: I do have a prognosis for coal. The best grade of coal is metallurgical coal (met coal), used to make stainless steel and other higher quality metals. Met coal comes out of central Appalachian mines versus steam coal (power plant demand) coming from Wyoming. Met coal costs roughly 40% more than steam coal. There are four different grades of coal mined in Illinois, North Appalachia, Central Appalachia, and the Powder River Basin. There are other mines in Colorado. The northern Appalachian coal is the best coal and it sold as high as $150 a ton in the last major rally. It has now come back to about $90 a ton. The highest price I saw on met coal—this is the best you can buy—was paid by Korea with a contract of $330 a ton. Those buyers might still be stuck paying that higher price on current contracts despite new deliveries costing only $90 per ton. In looking at the Dow-Jones coal chart, it was up around $450 and went down to about a $100. It’s back to $200 again and the moving average is $435 for the 200-day price. We think we can regain those higher prices but very gradually over five years or more. Oil and gas came down severely as natural gas sank from $14 to about $5—that’s a big drop. Oil is down 70%. It collapsed from $140 to $40. And, with the break this past week under $40, some are now saying $20 is next! Now, coal didn’t do that. Coal came down roughly 20% on its prices. The primary difference is a higher percentage of coal demand is supported by power plants. For quite some time, China was turning out two brand new coal fired power plants per week! So, while there’s been a drop in the coal prices, they have not really skidded down like some of the other energy areas. I think coal prices will come back a little bit, but what we’re going to see is a more of a stabilization. The difference between coal and something like natural gas and particularly oil, is that oil is in a fundamental global shortage. Coal is more plentiful but the recent price spike has more to do with transport and handling problems than pure out of the ground shortages. In the U.S., we’ve got a 300- or 400-year supply of coal. The fundamental problem is suppliers can’t get it from the mine and transport it to where it’s being used fast enough. TER: So, looking at some investor plays, what do you see coming up in the commodity market to invest, that investors should look at as a general trend? RW: The two best commodity plays for next year, in my view, are gold and soybeans. Corn and wheat are going to be good, too. Wheat is very hard to trade. Corn is the biggest commodity by volume as far as traders are concerned, next to oil. Oil will go up; there’s no question about it, but we don’t see it rising to where it was before. To give you an idea where oil prices are, I did some technical analysis, and my forecast for the newer high price for oil, based on what’s happened with the tech data we have right now, is about $65, and we are about $40 today, which is not that much of an increase. This is a trend but certainly not the best and easiest trend for traders and share investors with which to make some money. Goldman Sachs said they’re forecast for crude oil next year (2009) is $75, and they just reduced that back to $45. Their primary reason was the recession influence and skidding global demand. TER: But isn’t OPEC cutting production? RW: Maybe they are, but not to the extent published in the news. OPEC simply needs the money—right now. They’re spending crude oil income cash at a proforma oil price between $80 and $85. This means that if $40 prices are sustained they must cut their spending in half. This is not easy to do as massive expenditures have been committed for infrastructure, development, construction projects, and other new commercial enterprises demanding higher cash flows for years. Now, with their budgets based on that kind of an income, and since oil fell down to $40, they’re in a backward situation, putting a lot of pressure on all of their projects. Also, keep in mind most Saudi oil is what they call “heavy oil” or crude sulfur oil, which is not as clean as some of the other higher quality product—the sweet light used for unleaded gasoline production. Heavy oil can be refined, but the number of refineries that can manage it are in short, short supply. Valero owns 15 of those heavy oil refineries capable of refining this dirtier, heavy oil product. They wisely could see what was going to happen long ago. They went out and bought up all the heavy oil refineries they could obtain. Valero is running 15 of those right now, and it is my understanding there are one or two new ones being developed, or remodeled. TER: In the U.S., Total (FP:PA) (NYSE:TOT), the French oil company, has a large existing refining operation in Toledo, Ohio. A massive expansion has been approved, much to the chagrin of the greens and tree-huggers. It’s going to be under construction for the next three to five years. This major remodeling addition will increase that refinery capacity by roughly +50%. It’s already a very big operation and is quite valuable. This location sits in the middle of the Midwest containing 85mm U.S. citizens within a one-hour airplane ride. Now, here’s something about oil that a lot of people don’t understand. We have been focused on Saudi Arabia and the Middle East as our top U.S. oil supplier. They are no longer the largest oil producer for America. The top supplier of crude oil to the United States is Canada; and Canada is also a very large supplier of natural gas. Canada needs a large amount of natural gas at their crude oil tar sands mines in Alberta for refining. Mined feedstock is heated to cook tar oil out of the sands. These producers keep adding to their operations so natural gas demands continue to correspondingly increase. Canadian natural gas has been delivered to Chicago and the Midwest through pipelines and then diverted to five or six states. In that region there’s probably 50 million people within reach of that supply. Considering the U.S. population is 330 million, this gas is delivered not only to the heartland of our nation but also to the core of national industrial production. With our recession going deeper, the natural gas demand is down and will probably be lessening even further. For the shorter term, say three to five years, this gives demand relief to Canadian producers. But over the longer term, Canada is using more and more of this natural gas themselves. In 2009, they will be supplying 10% less to the U.S. next year versus last year. This production cutback doesn’t matter for now as we temporarily demand less gas. We forecast this will change after the U.S. recovers from our current recession and soon to be depression. So in the future, prices should rise on less available supply from Canada. RW: Yes, it is. It is significant; I will tell you what is even more significant. Mexico has an oilfield that is called the Cantarell Field. The Cantarell Field is expected to go dry at the end of next year; (2009) and that field has been the main income producer for all of Mexico. It’s owned by the government and they use the income to pay government bills. What happened was production has diminished drastically and surprisingly over the past few months—actually at an alarming rate. The surprise projection is Mexico can’t get any more oil out of Cantarell after the end of next year. Now, here’s what makes that even more significant. That oil from Mexico, from the Cantarell Field, is the feedstock for refineries in the United States, all along the Gulf Coast, in Texas and Louisiana. That is 10% of the imported U.S. crude oil supply and at the end of next year, it’s gone. It creates two interesting phenomena; one is 10% less oil coming into the United States, and second, you have a more unstable government in Mexico. And the unstable government in Mexico is, I think, probably going to be the worst problem we’re going to have to deal with from what I can see and what I hear. TER: Now the tar sands fields in Canada, could they make up the difference from this Cantarell Field in Mexico? RW: I think Canada could but not for many years. Mexico has discovered a replacement oil reserve but it's years away from production and they do not want to partner it with big oil companies. The project is stopped for now as Mexico does not have the technical prowess to build this new oil field. And, without the big oil boys to help it’s stopped dead in its tracks. I am not sure Canada could increase tar sands production that much that quickly. Could they do it over the longer pull? I think they can. But, this is a very expensive manufacturing process requiring great skill, engineering sophistication and plenty of new facilities costing millions to design and build. Now, here’s something else that is interesting about oil and offshore drilling. According to federal government data and also to U.S. Minerals and Management who did some studies, they say they have a rough estimate indicating the U.S. has enough oil and gas to fuel 65 million cars for 60 years and enough natural gas to heat 60 million homes for a hundred and sixty years. The government estimates there is 30 billion barrels of oil on federal land now closed to leases and drilling. We cannot develop it under existing rules and law. That’s where we are now. Somebody else did a study, saying there’s $1.7 trillion in government energy lands that could create thousnds of new jobs if, in fact, they would open up these oil and gas fields now off limits. Primary areas are the Rocky Mountains for natural gas; in the oceans, in the Atlantic and in the Pacific. There is also supply on the intercontinental shelf with the other one being in ANWR, located in Alaska. And, there is apparently a lot more near the Arctic than most people realize. These are significant amounts of gas and oil in our country, or around our country, which are now basically off limits for producers. TER: So you have basically identified a major source of potential revenue that the government could tap into, also creating jobs, which is oil and gas. Well, do you think that they will come to that conclusion and open up those restricted areas? RW: I think those restricted areas are going to be stalled for production for a very long time, and I will tell you why. Oil and gas prices are down because of the recession. I think the recession that we have in front of us—will be in process for years. I think we see 5 to 10 bad years on the outside. Consequently, with prices being so low, with that kind of recession, it’s not going to give producers the idea, the impetus to go out and do new drilling; which they should be doing. Somewhere along the line it will catch-up to us because we’re simply not doing the exploration and development work that we should be doing. In the longer view and big picture, global demand will rise and new sources of energy will not be developed. Eventually, this plays into higher prices. From Trader Tracks (12/19/08): "OPEC and others announced production cuts to remove excess inventory from the crude oil markets. After finding lower support near $40, oil snapped back to $50 and retreated again. OPEC has national spending budgets based upon oil at $75-$85 per barrel and are only earning half of that. Further, when paid in US sinking dollars they are losing even more on currency trading. They never like to curtail production, especially during times of overspending, but some cutback must be implemented now. "We suspect the cuts are more talk than action but there is a massive flotilla of filled ship tankers holding a huge crude oil inventory. Until this on-the-seas-supply is off-loaded and used up, oil prices are projected to stay in the basement for several weeks. Our 2009 crude oil forecast is for $65 to $75, a substantial increase, but only after a major drawdown in global inventories months away." TER: So are you saying there aren't any attractive oil and gas plays in the U.S. at this point? RW: There’s none that really look very attractive for the near term. Now that could change. We expect 2009 prices to rise again. Use the example where we are today; if natural gas is at $5.55 and it’s going to go to $9+, that’s nearly a double. Can you trade gas? Yes, you can. It’s very volatile and frowned upon by many experienced traders, but it can be traded, as a very quick moving target. Maybe an ETF on a share basis might be a better way to go, and we’re going to do some work on that. In addition, if oil is $40 and it’s going to $70 on my projection or, to $65, that does leave upside room, but is that the best place to trade? We say probably not. We think currencies will be a better trade for next year with gold and grain. We also believe shorting bonds and shorting the stock market will be an exceptional trade next year. We like grains from the standpoint of projected shortages, lack of credit and weather. You can also short a lot of these stock indexes, in a selling stock market. We don’t do any work with meats at all—cattle, hogs, pork, or anything like that—but those things could be volatile because of what’s coming in food inflation. Gold, I think, is going to be one of the best, along with some grain. Silver is behind, but should catch up. Base metals will be up a little bit with inflation but stay mostly flat or down on the recessionary trends. Markets like orange juice, coffee, cotton, sugar, cocoa—all of these are difficult to trade and extremely volatile. However we see several excellent things to trade in 2009. Currency trading might be one of the better markets next year. TER: Are there any equity plays that you can recommend? RW: Yes, we’ve got some fertilizer and precious metals stocks that should be excellent. They’ve gotten beaten down with the general markets. There are several ETFs that offer good trading ideas. Some senior miners we like in gold and silver should be excellent in the first quarter of 2009. Mining equipment manufacturers like Joy Global Inc. (Nasdaq:JOYG) produce coal and mineral handling-digging equipment. Caterpillar is sold out for two years on their off-road monster mining trucks. A large part of CAT is overseas so, there’s plenty of opportunity out there if you know where to look. And of course we're high on gold, currently moving from $850, $865, and to $907 on an immediate high. February, 2009 gold futures are trading from $850 to $865. We forecast gold between $850 and $907 this year. For April, 2009 futures our high gold forecast is $1260. Our view on the stock market right now, and we’ve got it in our Trader Tracks Newsletter and on KITCO, is that we expect a stock market rally between now and April 1st which could take the Dow back to 10,400-10,800. And then in April and May, five bad things happen at the same time. The Dow could sink to 7250 or maybe even 5500. We’re looking for big markets trouble in April-May and in September-October next year. I think temporarily, I would rather be on vacation in another country in those time cycles. It’s going to be that bad. We expect a monster market crash next year in the fall. Hopefully that’s the final bottom of this mess. TER: That’s going to be bad. RW: Not pretty, not pretty. You see nobody is buying anything; there’s no engine of growth; there’s no spending going on except by governments. They are the only big spender and this is just a continuous drain; a millstone on our economic necks. TER: So are you looking now that we’re going to get to a depression and not just recession? TER: So, that’s a definite? RW: I am absolutely convinced of it, yes. But along the middle here, maybe late spring or into the summer we could see a severe inflation, too, because President Obama’s going to throw a trillion dollars at this economy to produce make-work jobs and prop things up with WPA-type jobs for a major rescue. It will work for a little while, but it’s going to induce high inflation, and then later on, down we go again stuck in deflation. TER: Where is the bright star in all of this, Roger? RW: It would be nice to see the Federal Reserve go away eventually; they were part and parcel of all of this. As soon as they write down, or write-off all of the derivatives and get housing back to reasonable prices again, I think we can recover. There is some history on this stuff. If government would just leave things alone, it would shake out, and we would gradually heal up and do much getter. Meddling makes things much worse and can extend the pain for years. TER: It will take awhile to unravel it. RW: Business should be soft and slow; things will be inflationary expensive and very sluggish. Is it the end of the world? Heck, no. It’s not going to be the end of the world. We’re going to keep trading. We actually think that next year for us is going to be super-duper. A native of Michigan, Roger has had an interest in precious metals and futures since the commodity rallies of the late 1970s and early 1980s. His background in a 25-year real estate development and construction career specialized in forward planning, consulting, and using creative skills for conceptual project thinking. His present work is focused on the precious metals, currency, energy and interest rate markets for trading on the primary American exchanges. Experience in land, development and base material projects has evolved into consulting for mining companies and analyzing those markets. He has developed longer-term ideas for finance and mining marketing doing work on behalf of private and public mining companies. Roger’s consulting work is to focus on concepts and “big picture” forward planning for mining companies. His newsletters utilize the global news, and his personal research and knowledge for expressing personal trading ideas. The Energy Report is Copyright © 2008 by Streetwise Inc. All rights are reserved. Streetwise Inc. hereby grants an unrestricted license to use or disseminate this copyrighted material only in whole (and always including this disclaimer), but never in part. The Energy Report does not render investment advice and does not endorse or recommend the business, products, services or securities of any company mentioned in this report. From time to time, Streetwise Inc. directors, officers, employees or members of their families may have a long or short position in securities mentioned and may make purchases and/or sales of those securities in the open market or otherwise. Streetwise Inc. does not guarantee the accuracy or thoroughness of the information reported.